Looks like the iPhone 5 got its payback for Samsung’s “It doesn’t take a genius” ad without Apple having to lift a finger. A recent post by Samsung on its Facebook page asked the question “If you could only take one electronic device on to a deserted island, what would it be?” Unfortunately for them, it had completely unexpected and hilarious results. Well, maybe Samsung isn’t laughing but Apple definitely is. Naturally, Samsung expected that most of the frequenters on their page would be Android and Samsung fans. 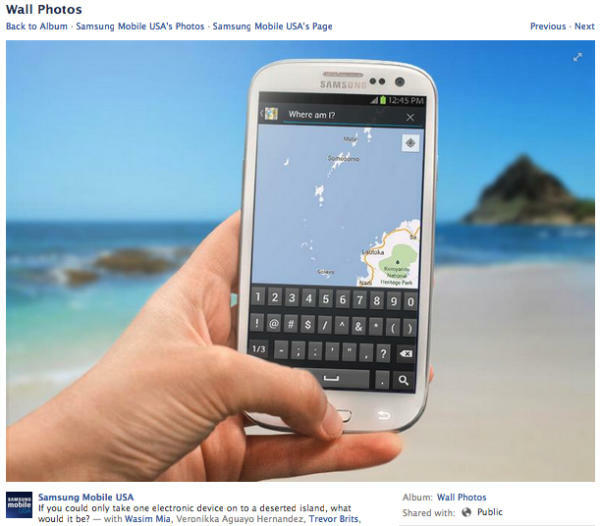 Based on the photo they included, which showed a Samsung Galaxy SIII in a tropical setting, it’s also safe to assume that they were expecting most people to say that the Galaxy SIII would be the device that they’d choose to bring with them on a deserted island. We’ve dropped by the Samsung Facebook page ourselves and saw that the most recent comments are still referencing the iPhone 5 and other Apple products such as Macbooks and iPads. There was even one comment saying that their preferred desert island companion would be the Nokia Lumia 920. Our favorite answer though? “An electric boat.” We think that one makes the most sense.